Continuing on the slipper marathon that we have created ourselves on Design-Peak we are adding another slipper tutorial. Last couple of tutorials were knitted, however the main techniques and overall ideas could be perfectly applied to crochet projects as well. Today we are sharing crochet only tutorial and it will be a bit harder to translate it for knitters. 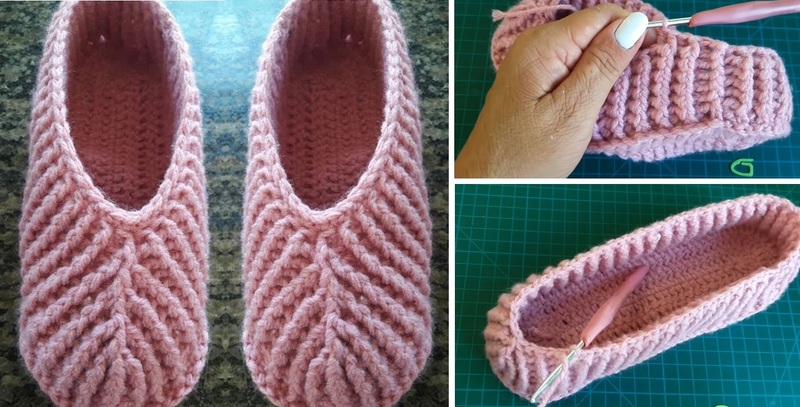 We are going to learn to crochet this very beautiful and handy slippers. They are made somewhere within an hour and the process is quite straightforward. We might even say that the tutorial can be viewed as somewhat beginner level (of course what we count as beginner might be a little bit subjective). The only downside is that the video tutorial is not in English unfortunately. We are going to search hard to find English substitution for this explanation, however meanwhile we suggest to take a look at it. Since the explanation is very well delivered visually, you might it find it easy to follow it as well.